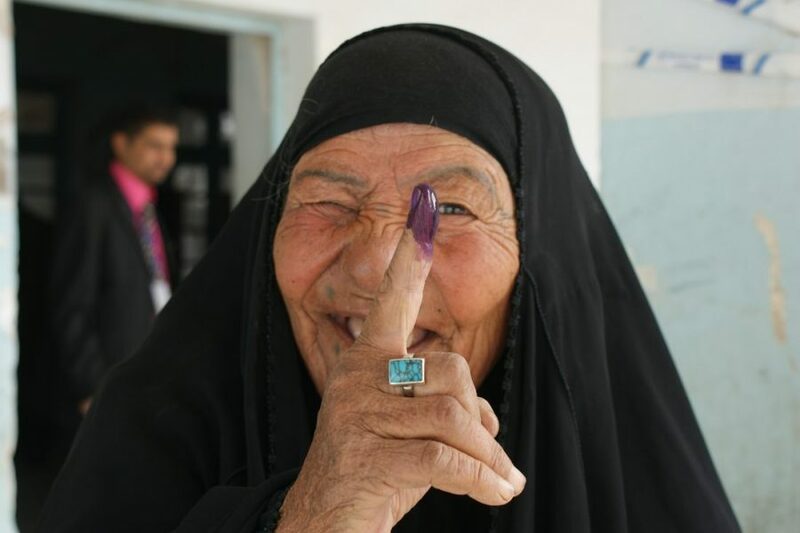 Female voters display their purple finger tips after casting ballots at an elementary school in Nasiriyah March 7. By law, women must fill 25percent -- 82 out of the 325 -- parliamentary seats. The heavy purple dye reduces attempts of double-voting fraud. No election day violence occurred in Nasiriyah, Iraq's fourth largest city bisected by the Euphrates River in the southern province of Dhi Qar. Iraqi security forces were responsible for all security. Nineveh’s female parliamentarians provide an interesting case of the roles women can and do play in Iraqi politics. The 25 per cent representative gender quota, enshrined in the 2005 constitution and the electoral laws that followed, has enabled women to win parliamentary seats. And while many dismiss the quota as electing women who toe the party line, Dr Al-Saraj and her colleagues show that this is patently not the case. So what remains as a barrier to women’s post-conflict participation and increasing their parliamentary representation beyond the 25 per cent threshold? According to Dr Al-Saraj, violence against political actors including women and the politicisation of peacebuilding efforts are major barriers. This article is published under a Creative Commons Licence, originally published on Australian Outlook.